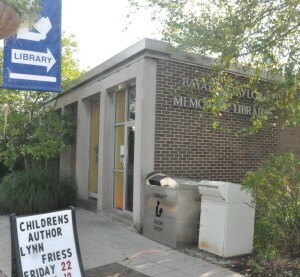 Like all 18 of Chester County's public libraries, Bayard Taylor is again facing cuts in state aid. PENNSBURY — The Bayard Taylor Library is going ahead with plans to be part of a new $30 million complex as part of a larger project with the Kennett Area YMCA and Anson Nixon Park — but officials from the library want township residents and officials to know how much they appreciate local support for the ongoing operation of the library. Library director Donna Murray and the president of the library’s board of trustees, Susan MacDonnell, a township resident, appeared at Wednesday’s night township Board of Supervisors meeting to update the township on the status of the library. According to Murray, the township is coming very close to funding its “fair share” of the library’s operation by giving $32,000 a year to operating costs. The other seven municipalities fund the library at varying rates — finally. The last holdout, Pocopson, finally resumed funding operations in 2010. Murray said Pennsbury residents are responsible for about 10% of borrowing at the library. About half of the library funding comes from the state, although those funds were cut by 24% last year with more cuts likely in the coming state budget, meaning that the library, which has been forced to reduce staff, is even more dependent on local towns to help cover costs. Kennett and East Marlborough both have dedicated library taxes, while the other six municipalities contribute a lump sum to operation from the general revenue account. Murray points out that, in the long term, the library saves taxpayers — at least those who use the library — money. She calculates that in 2009, the library saved Pennsbury residents a total of $193,000 in money they might have spent on books, DVDs and other media materials, but instead were able to borrow from the library. That doesn’t count the increased opportunities for education and the various free programs for residents, either, she notes. And right now, with the economy suffering, people need their libraries even more than usual. Despite having to cut staff, Murray said that circulation is up 5.3% at Bayard Taylor — so she said she wanted to remind people that the library is a needed public service, even if it seems at times like other things, like public safety, should get funding priority. Meanwhile, plans are moving ahead for a new library building, said MacDonnell, the president of the library’s board of trustees. The new complex, to be located at the corner of State and Willow streets in the downtown area of Kennett Square near the current YMCA. The new library, expected to cost roughly $8.5 million, will be a two-floor building will have a total of 23,000 square feet, more than twice the size of the current library, which is located three blocks west of the proposed location. The plan right now, if for the new building’s infrastructure to be much more efficient, allowing heating, cooling and energy costs to be kept close to the current building. New technologies for — particularly for book returns — will also be incorporated to reduce the need for additional staff in the much bigger facility. MacDonnell noted that by joining together, the three groups can coordinate fundraising for the project, rather than competing for dollars. That fundraising campaign is expected to kickoff in the summer of 2011. She estimated that fund raising would take between two and five years — and if it lags some of the project could be done in stages, meaning it could take up to a decade to complete.